The next morning thankfully turned out to be a sunny one and we prepped ourselves for the Park. As mentioned in the last post, the walk to the National Park was only about 300 meters from our hostel. As we walked toward the Park up ahead in the Park trees a bunch of the tree tops began to rustle and a deep, penetrating roar could be heard coming from the rustle… It literally reminded me of a scene from Jurassic Park with a T-Rex about to emerge from the dense forest, roaring as it did!! It was a little unnerving until I was informed that it was only a Howler Monkeys making the noise and that there was nothing to fear. When we arrived at the entrance (about 8am) there were already a ton of tourist groups lined up in various places getting their troops together to enter the Park. B, A and I purchased our tickets (again $10 for tourists though this time I paid with colones and paid less than $10… perhaps it was because of the current daily exchange rate that the Parks do pay attention to) and entered the Park. A few things we were told through the grape-vine about the Park prior to entering was #1 do not hire a private tour guide as many other tourists do this so you can always “bum” in their tours by simply looking where their tour guide is pointing to find something interesting and #2 go off the beaten path when possible away from the rest of the tourists and you will be guaranteed to see much more! Keeping that information in mind we set in our walk without a guide. Both pieces of advice above came in great handy as alone the main path of the Park several tour guides had already set up shop with their binoculars on tripods pointing out insects and crabs to their hired tourists or pointing high in the trees sharing interesting information on a particular plant or tree. Luckily for us, B was a botanist (there is actually a more accurate name for his title, I just can’t recall what it is… Sorry B!! But I do know that his work involves cataloging every species of plant and tree!) and he knew just about everything there was to know about every plant so in a sense we already had a fabulous guide for that portion. We made our way along the path sighting many spiders, a scorpion eating a wasp, a variety of crabs hidden in a variety of clever places, a toucan (YAY!!!) and lizards!! At a certain point we came across a point of crossroads where we could either go straight, right or scootch our way around the “closed” sign of a path to our left… Well of course we chose the path to our left!! 😉 The path was closed because it hadn’t been groomed recently, but it didn’t bother us at all. We made our way up the path to a quiet area where no sounds except that of nature could be heard. It was amazingly blissful!! So quiet with only the sound of the wind rustling gently through the trees. It is quite an amazing thing to stop and just listen to the beauty of nature!! We stayed there for a bit taking in the sounds until some new sound caught my attention high in the trees. Of course curiosity took over good sense as I followed the noise only to spot my first Howler Monkey!!!!! Such amazing creatures!! These small, black monkeys with faces so familiar in human features and hands even more so familiar are just an incredible sight to take in!! They travel in troops usually anywhere from about a dozen to a dozen and a half! There is only one alpha male of the group and the rest are females or young males and it’s also pretty common to find a new mom in the troop as well. Their hands and feet, as well as the underside of about the last 6 inches of their tail do not have any fur on them so they can easily grip surfaces. The roar of the alpha male can be heard from great distances around! I have since found out that they only roar early in the morning or to announce to another approaching troop that they are coming too close to their territory, or if rain is approaching! As I gazed above me in wonder, they simply gazed right back wondering what it was I was up to! I of course took a few photos and kept my voice low as I called my friends over to see them as well and then we continued up and up and up the path again passing many other lizards and even an Agouti or a Tapir that ran off too fast to take pictures of (hence why I’m not entirely sure which it was exactly… but it was definitely a land mammal). The path ended on a platform at what seemed like the top of the world!! Though it wasn’t a 360 degree view, it was still magnificent!! You could clearly see the bay below and the jutting rocks that formed it, as well as a little cave carved into the rock, as well as the land clear south of us all the way to what we speculated to be the Oso Peninsula!! After several pictures we headed back down the path to the main portion passing many other tourists who had also opted to take the “unbeaten” path. Now sadly, it was about this time that the batteries in my camera started to fail… I was able to get a picture or two in, but then would have to shut the camera down, take the batteries out to rest for several minutes then reload them and pray they would work again for a few more pictures!! There are about 5 walking trails in the Manuel Antonio National Park and we ended up taking each of them to their various destinations. Along another path of interest, we came across a tourist and his young son. They were surrounded by a large troop of Capuchin Monkeys!! The Capuchin monkeys are most famously recognized from their white faces and black bodies, as well as their “star” quality. They can be seen in movies such as Outbreak and the Hangover Part II, as well as in the TV show Friends. Now I don’t advocate the use of wild animals for our entertainment, nor was I thrilled about the scene we had encountered. Despite the Park rules that warned to NOT FEED THE ANIMALS this father was blatantly ignoring them as he and his young son continued to offer the monkeys a variety of fruits. While it was quite an amazing feeling to have so many monkeys coming at you and around you in every direction all trying to get their piece of fruit, I opted to remove myself from the center as I do not agree with feeding wild animals, and this next bit is part of the reason why: At one point the young son was trying to offer one of the monkeys a piece of fruit. The monkey was quite reluctant to simply take the piece of fruit from the boy’s hand, so it didn’t. The boy, probably too young to understand the wrong in his behavior and not being told otherwise from his dad, continued to push his arm forward toward the monkey, trying to entice it to take the fruit. A few moments later, the monkey had had enough and literally slapped the outstretched hand of the boy away and screeched!! The father finally stepped in and told the boy to no longer feed the monkeys and they headed away. Wild animals are wild folks, and should remain that way!! We have no business interfering with their nature and even less business trying to tame them. Ok, I’ve said my peace on that topic for now… moving on! We hung around this beach for a bit wading around the water and taking pictures (camera battery pending) and then started to head toward the exit. The exit path went right along another large and lengthy beach portion that once again made me “tisk” at myself for not thinking to bring a suit. Many tourists were lined on the beach taking in the sun and enjoying the water. We even spotted some caper bandits (i.e. raccoons) going through some tourist bags that were left on the beach for some goodies they could eat. All in all we had already spent about 4 hours walking around the Park, so each of us were ready at this point to exit and get something to eat and of course a cold brew. When we reached the exit, we were greeted by a few men with little row boats. Indeed the only way to exit the Park (unless you were willing to walk ALL the way back to the main entrance) was to cross a little river, too deep to wade through (another reason the suit would have come in handy!!) for $1.00 a piece! With no other real choice we all paid and took the maybe 15 meter boat ride back to the “main land” and headed back to the hostel. The rest of this day was spent simply relaxing, enjoying good food and of course some good beer on the beach!! It was quite a nice ending to a fantastic Park day! It was during this afternoon that B, A and I shared our plans for the next day. “A” had only a few more days in Costa Rica and planned to spend them in Montezuma (on the tip of the Nicoyo Peninsula). “B” opted to spend his remaining days in Costa Rica in Manuel Antonio, and I planned to continue heading South to Uvita. I took a bus ride to the volcano with all my gear in tow thinking there was a town nearby where I could stay for the night, and not really fully understanding that the volcano was located in a National Park… Therefore NO sleeping facilities… In any event, the ride there was almost entirely uphill and quite cloudy. There literally were times when I had to stop watching the road and just trust that the driver knew what he was doing because it became so cloudy at times that it was hard to see more than a few feet ahead!! We reached the National Park entrance and all tourists on the bus were asked to get off so we could pay. All National Parks in Costa Rica cost $10.00 for tourists to enter, but if you are local it’s cheaper. I’m not entirely sure how much cheaper, but none of the locals had to get off the bus to pay, but rather they were all counted up and paid for by the bus driver. It was standing in the line to pay for the park where I met two fellow Americans. One was teaching English to students in Alajuela, and the other was a retired gentleman who was going to head to Puerto Viejo after a short stay in Alajuela to potentially retire there. Once all the payment business was over we loaded onto the bus and were dropped off in the bus parking lot… Perhaps now is the time to bring up again that since I was thinking that I could stay the night in or at least very near the park, I had brought my backpack with me… Well, when we were all getting off the bus, since I wasn’t sure whether we were going to have the same exact bus on the way back down, I thought it best to bring my backpack with me. But what this meant was that I was going to get a bit more exercise than I had signed up for originally, lol!! Basically I hiked all around the park with my dang backpack cinched on me and cursing every time I had to walk uphill, lol!! Isn’t it just fantastic?!?!?! Ok, now I know it doesn’t look like much, but believe it or not you are actually looking at the volcano in this picture. Everyone looked and looked and looked around for some sign of where exactly this volcano was, but because of the low clouds, all you could see (as above) was mist. My two friends and I hung around for a little while longer and agreed that this (the dense fog) was probably the reason we were given 3 hours to hang around the park. 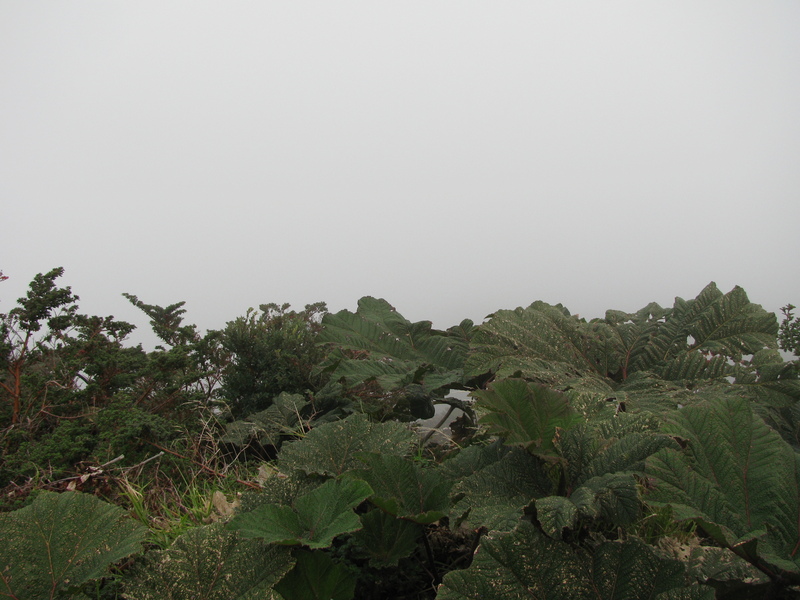 Apparently dense fog is quite common at this volcano and one must be very patient if they want to actually see it. Patience wasn’t very high on our list however, and since there were two other trails that led to a lake beside the geyser volcano, we decided to try our luck and see whether the lake was visible. Up and up and up we hiked through dense jungle forest on teeny concrete paths until again meeting our final destination. And can you believe it??? The lake looked exactly like the picture above!! Nothing but dense fog!! Once again we resolved to simply hang out for a little bit and got to chatting. And then it happened… In mid-sentence one of my new friends gasped at the image that unfolded in front of us. The clouds suddenly lifted revealing a beautiful green lake! This beautiful view literally only lasted about 10 minutes and then the fog once again swept in and obscured the lake from view. Thinking perhaps to try our luck at the geyser we immediately left (all downhill thankfully) and headed back to the geyser. The rain started to pour down on us as we went down and I even had to stop to put on my poncho before getting too soaked! Once back to our original station at the geyser, the fog once again showed no signs of lifting. But about 10 minutes later, just as it had at the lake, the fog miraculously lifted and you could see the geyser!! Just as the mist came and went within 10 minutes at the lake, the same was true for the geyser! We really lucked out on our timing for this trip!! After waiting for the fog to close back over the geyser, we headed back for a snack at the cafe in the park and awaited our bus. It was on the bus ride back that I was offered a free couch for the night at the girls place. I accepted the generous offer and we were all dropped off in Alajuela. The rest of the night was spent hanging out with my two new friends and the girls boyfriend. We had a great dinner at a local soda then wandered the streets for some ice cream at a chain place called Pops. Personally I wasn’t impressed by the ice cream there, but many people seem to enjoy it, so to each their own!